In Mexico, it's common for people to eat mangos every day, not only for their deliciously juicy flavor, but also for the health benefits they provide. One cup of mango contains 100 calories and a full day's worth of vitamin C, along with vitamin A, fiber and more than 20 other vitamins and minerals, while excluding cholesterol, sodium and fat. 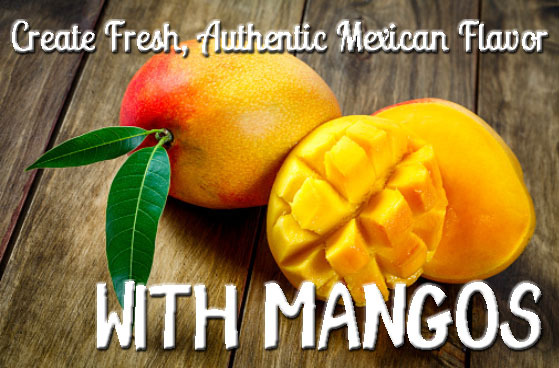 "I remember mangos practically from my birth," said Ricardo Muñoz Zurita, chef at Azul Restaurantes in Mexico City. "I'm originally from Tabasco and Veracruz, in the southeastern part of Mexico, two of the leading states for growing and eating mangos. I've always been surrounded by mangos, ever since I was a kid, so the mango is the first fruit I really remember." Some mangos are so tender they are difficult to eat except out of hand, but the golden Ataulfo mango has a creamy texture, often described as "buttery," that holds up well to slicing or dicing. Its smooth, almost avocado-like texture and mildly tart sweetness make it adaptable to many cuisines, providing a complement to the spice and complexity of Mexican food. In this tropical take on guacamole, the mango's sweetness brightens the richness of avocado. 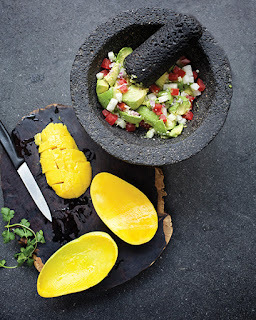 To emulate the flavor and texture of Muñoz Zurita's recipe, use caution when mashing the fruits to maintain bite-size cubes of creamy mango and avocado.